086. EREBUS. Issued by D.C. Thomson & Co. Ltd. in The Rover comic. (Date: ?). Card unnumbered; from a set of 32 entitled "Famous Ships". Size: Ca. 2.5" x 3.1". Recto: View of the Erebus among icebergs. 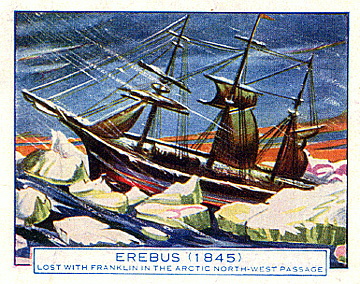 At bottom: EREBUS (1845) LOST WITH FRANKLIN IN THE ARCTIC NORTH-WEST PASSAGE. Verso: FAMOUS SHIPS | THE EREBUS | Nearly ninety years ago Sir John Franklin, one of Britain's bravest explorers, set out to discover the North-West Passage, the sea route from the Atlantic to the Pacific, round the north of Canada. Sir John's ship was the Erebus, and she was fated never to return. No news came from the expedition for two years, and in all 39 search ships left Britain to seek the Erebus.